Gold: to fall with base metals? If there is a sell off in base metals will gold get dragged down with it? In a recent article entitled ‘Trouble Brewing’ by Paul van Eeden on the Kitco website, Paul warned of the dangers that could lie ahead for gold should the base metals suffer a fall. Also in an interview on ROBtv the same scenario was outlined. As an aside I do enjoy Paul’s commentary and he is a very well respected commentator in the investment world. the end of the real estate boom coupled with a generally slower economic growth rate will cause demand for base metals to drop. I would have agreed with this hypothesis a few years ago when the United States was the worlds economic power house and the largest consumer of just about everything. However, I don’t believe that is the case today. When we look outside of the North American market what do we see? We see China and India deeply immersed in an expansion programme the size of which the world has never seen before. 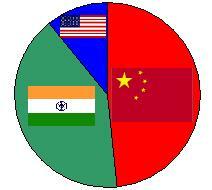 If we look at the pie chart below we can see the populations of China and India dwarf the population of America. China recently published its GDP as being in the order of 11.3%, its fastest pace in a decade according to The Daily Telegraph, which is massive growth and they have 1.3 billion people. This figure has been taken at face value but there are those who would argue that China has been known to be economical with the truth when reporting such matters. The Chinese and Indian people, like any other modernising nations can see and now want all the goodies and they are striving desperately hard to obtain them. One of my colleagues has just returned from a tour of China and he just could not believe the pace of development that is happening and does not look like slowing down in the near future. China has 15000 road projects on the go, followed by houses and cars, you name it, they want it! On this website we are primarily gold bugs, however, we can not see a fall off in demand for base metals for some time yet. Sure, it will be volatile for both base and precious metals but the world is hungry for both and they will be consumed in great volumes. This article is an attempt to add a different view to the current debate on the state of the market. So we will conclude by sticking our necks on the line. Gold prices will be north of $1000 by January 2007. Please feel free to add your constructive thoughts and comments, as they are most welcome. Golden Star is a medium sized gold mining company with major properties in Ghana, West Africa. Its gold production is un-hedged and therefore appeals to us, as the stock price should move in line with gold prices. Last year Golden Star showed their worth by producing 200,968 ounces of gold at an average cash operating cost of $365 per ounce, creating a new record for the company. Production this year should hit 300,000 ounces followed by 500,000 ounces next year, at a reduced average cash cost of $335/oz when the Bogoso-Prestea expansion project is completed. Later on this year the Bogoso-Prestea expansion should be completed which incorporates a sulphide/bio-oxidation circuit. This investment is costing about $125 million, however production will increase to around 370,000 ounces per year. A commitment by Golden Star to spend approximately $16.5 million on exploration clearly demonstrates their aggressive attitude to locating new sources for future mining projects. The Company has proved that it is well funded, which is part of our investment criteria, without funding then there just isn’t an opportunity to expand. Their management team has West African experience and is familiar with local customs and practises. The Market Capitalisation is $618 million and the share price $2.98 having had a recent high of $3.80 and reserves stand 4.05 million ounces. Trading volume has been low recently which may be a negative and delay progress slightly. However, after the recent market sell off a number of other gold mining stocks are displaying the same characteristics, so we view this as only a minor hindrance. The chart shows this gold mining stock is recovering and may go through some consolidation before moving higher. But as gold continues its resurgence then so will Golden Star. The stock is traded on the Toronto Stock exchange under the symbol GSC and on the Amex under the symbol of GSS. With the problems in the Middle East helping to push the price of oil to new heights is it time to take green fuels more seriously? Silverado is also working on the development of a coal-based alternative fuel. The fuel would substitute for oil in the generation of electricity and industrial heat. The US has enough coal to supply its energy requirements for at least the next hundred years, but coal is dirty I hear you all scream! But what if it wasn’t dirty? What if it could be changed to provide a clean fuel, and vastly cheaper than the price of oil? The economic benefits make it worth investigating and there is also the added benefit of ‘energy independence’, which has got to be a major plus. This brings us on to President Bush's Energy Policy Plan, the National Energy Technology Centre Vision 21 Program, and the United States DOE Clean Coal Power Initiative. Coal therefore could be the answer providing that it can be made available in a liquid form. Silverado Green Fuel Inc., based in Fairbanks, Alaska is developing an environmentally friendly oil substitute produced from Low Rank Coal. A pilot plant has already underway and will be used to produce this Green Fuel from ultra-low sulphur Alaska sub bituminous coal following hydrothermal treatment. This fuel performed extremely well in combustion tests giving nearly complete carbon burnout, and minimal fouling. It is a stable fuel that can either be burnt or gassified as required. It is environmentally friendly and far less hazardous than coal itself. For the more scientific amongst us please visit Silverado’s website to gain a greater appreciation of the process. Silverado’s videos are also very informative. How much cheaper is it? Current estimates put it at $15 per barrel. At this sort of price level it deserves more of attention. Silverado is working closely with State and Federal Legislators to develop funding through the government and also through private finance. During my discussions with Silverado they very kindly sent me a book entitled Artic Village by Robert Marshall, which describes life in the 1930s in Wiseman, Alaska. (Printed in the United States by Thompson-Shore, Inc) Its well worth a read if you can get your hands on a copy. The sluice plant is now operating for 24 hours per day and is running very efficiently. The quality of the gold recovered is of jewellery quality and commands a 67% premium over and above the gold price. Silverado have reported that they expect to sell the larger nuggets for around $2000.0 per once. The total gold recoveries and related financial numbers will be released throughout the year – watch this space for further developments. Is Gold affected by the Base Rate? There are a number of writers who seem to think that the base rate controls gold prices, absolute rubbish! Beware these people as they are either; only 12 years old, really thick or had a memory transplant. Back in 1980 when I first traded gold I was working for an American company based in The Haag, Netherlands, Europe. I was about to relocate to Edmonton, Alberta, Canada, in January 1981, which I did. Having sold my London apartment I had a reasonable amount of cash in the bank. This presented me with a problem. A nice one, but nevertheless I had to make an investment decision. Doing nothing is still a decision by the way. Do I invest in the gold mania or stay in cash. Gold was close to $800.0 at the time and guess what? The base rate was 19%. It was neck and neck between the bank and my employer as to who was paying me the most. My wages were the same as the interest I was getting from the bank. So, if a base rate of 19% could not hold gold back why does anyone think that a base rate of 5% is going to anything to stop gold prices rising? There are a few technical analysts out there who address this issue with considerable expertise; it is worth taking the time to read them thoroughly. Back to the decision: In 1980 I used graph paper and a pencil to calculate rough moving averages, etc. I concluded that the gold market was too hot and waited patiently for a sell off which came when gold dropped to $500.0. Hoping for a bounce of about one third of the price drop, which was $300.0 I needed a re-tracement of about $100.0. I went to the bank and bought on margin of 2:1. I put £12,500.0 in and the bank matched it. Gold bounced back to $600.0 and I made a tidy profit. For all the Ice Hockey fans out there it is hard not mention a kid I saw score a 3 times in 17 seconds playing for the Edmonton Oilers. He turned out to be Wayne Gretsky and 3 fabulous years followed before I left Edmonton. In my humble opinion Gold is on the move and the biggest mistake that we can make is not to be in this market. Whether you purchase the same gold mining stocks that we do or not, is not the issue. We believe that we are still at the starting post for gold and that it has a very long way to go. The best place to build a gold mine is next to another gold mine and Klondike Star is slap bang in the middle of the worlds greatest ever gold rush. This is the stuff that dreams are made of, the search for the mother lode. If you don’t have dreams they can’t come true. This area of the Yukon has produced placer or surface gold for over a century. However a mystery remains unsolved, where is the mother lode that gave birth to all this placer gold? Someone who thinks he knows is the well known and respected Canadian mine finder Richard Hughes who has been able to evaluate the property and has determined that the source of the placer gold is in the 3 shear zones that intersect Lone Star mountain. The 3 shear zones contain fine gold locked in pyrites. The formation also contains lode gold, or nugget gold found in the drain offs coming from the mountain. If Richard Hughes has diagnosed the situation correctly then the shear zones could be the source of nugget gold. If so, then this exploration could lead to a considerable discovery. Investing hard earned cash on one mans predictive analysis is a gamble, but he is no ordinary man as his experience shows he has made significant discoveries in the past. We also take some comfort from the fact that the Lone Star claims comprise nearly 1,200 mineral, or underground claims, so we are in the right place. And what of the company? Well, Klondike Star Mineral Corporation is a well-established exploration and development company actively engaged on eight major properties in the Yukon Territory, Canada. Their property consists of 390 square kilometres of land underlying the site of the Klondike Gold Rush. There is also some 93 square kilometres of land in other parts of the Yukon, which has been specially identified for exploration. The trading volume has been on the increase lately, which is another good indictor. It doesn’t mean that the stock price will go up automatically but if the volume were falling then the stock price would possibly head south. We are buying with the intention of holding for a year or so. This gold mining company is capitalised at about $95 million. We are happy to accumulate at the current price of around $3.80. This stock trades under the symbol of KDSM on OTCBB; the usual brokers such as Etrade should be able to execute your instructions. Please visit their website and take the time to watch their videos and see if you get a feeling of competent professionals going about their business. The photographs of the northern lights are spectacular. We can see from the graph below that recent increase in trading volume and the steady climb from $3.50 to $3.80. As always some retracement is possible. G8 demands a halt to hostilities in the Middle East, but is anyone listening? As our illustrious leaders meet in St Petersburg, Russia, the hostilities continue unabated. The pleas and platitudes continue to flow but fall on deaf ears. George Bush blames Iran and Syria for sponsoring Hezbollah while European Leaders call on Israel for restraint. In the middle of all this Russia hope to be given membership of the World Trade Organisation but the United States still has not allowed them entry. Is it me? Or are their priorities somewhat misguided? Would it not be better to concentrate on getting one thing right instead of this butter fly approach of flitting from subject to subject without solving any of them. The Middle East problem has existed for many years and despite the Camp David meetings, the road maps, the initiatives, we have absolutely nothing to show for it. Maybe it is time for a different approach, a non-political approach where a small team of ‘ordinary’ people from a selection of countries sit down with representatives of the aggrieved parties and sort it out. Could they possibly do any worse than the mess we have now? Is Newmont an over weight elephant too heavy to fly? Rhonda Brammer of Barron’s thinks it is a great time to buy Newmont. In an article on the front page of The Business, dated 9/10 July, entitled ‘Newmont Mining: the goose soon to lay the golden egg’ Rhonda Brammer puts the case for buying gold and also for buying Newmont. If you are contemplating buying Newmont then we suggest that you read her article. The article is very well researched and very well written. It contains facts and figures along with a couple of interesting graphs. There are quotes from the Chief Executive, Wayne Murdy, as well as the company chairman Pierre Lassonde. There are also quotes from BMO Nesbitt Burns, RBC Capital Markets and Citigroup who expect Newmont's shares to sell at $75. All good sound research so far. As we on this site expect gold to go along way we would automatically fall in line with the gold bull argument. However, then we come to the comparable analysis, a comparison is made between the progress of Newmont and the S&P500. We struggle with this as a basis to recommend Newmont as the S&P500 covers a wide range industry sectors not related to gold. Why is there not a comparison between Newmont and similar companies in the mining sector? If we compare Newmont with for example Kinross Gold, market Capitalisation of approximately $3.7 billion then a different picture begins to emerge. If we go a step further and compare Newmont with Bema Corporation, market capitalisation of $2.2 billon, then Newmont’s growth in percentage terms does not look too good at all. We can see from the two graphs below that both these two mining companies have dramatically outperformed Newmont. There are other mining stocks that would also produce a similar result. When one invests in this sector of the market it is usually in hope of higher than normal stock market returns. Newmont has been analysed to pieces and its value is well known. It is difficult for us to see where the growth for Newmont will come from and its past performance does not offer us any encouragement. We can only conclude that we will not be buyers of this stock at the moment and cannot foresee a reason to change this stance in the near future. Gold set to rally in September? Is gold set for yet another rally in September? Over the past few years gold has always had a spectacular end of year upward rally, always starting around September. In September of 2003, gold prices went from around $350 to approximately $425. A $75 move, a 20% move. In 2004 gold prices moved from $400 to $450 at the end of September. A $50 move representing a 12.5% increase in gold prices. Last years action will be explained in detail further on in this article. The graph below shows the September rallies of recent years. Investors getting into position, anticipating a September rally, may cause a small upturn in gold and gold stocks before we enter September. So buy your gold or gold mining stocks before we enter that period. However, last year gold began its move upwards literally as soon as we entered September and it continued to rise throughout the month. By the end of September gold prices had climbed nearly $40, from about $435 to a high of over $470. A $40 dollar move in a month doesn’t seem that dramatic now, when we have seen gold prices move $10, $20, and $30 even $40 in one day! September only signifies the beginning. After the September rally there should be a consolidation for about a month. Then gold will probably rise about 20% from the end of November until the end of January. Providing that gold prices stay above $700, a 20% move would force gold to test its all time high of $850 by the end of January. So now that we have established where gold prices are going, the next point is how to take advantage of them. Of course the most obvious option is to buy gold bullion. By purchasing bullion or a gold ETF you will track gold price exactly as you shall do as well as the gold price. This is the safest way to trade gold. However to maximise the benefit and increase you leverage on the gold price, you would be better off buying gold mining stocks in the HUI. The HUI tends to outperform gold as is shown in the chart below. I think that buying gold mining stocks is the best option. You may want to buy a mix of stocks and physical gold for added security though. Try to buy mid sized gold producing companies, as large companies like Barrick and Newmont are usually slow to follow gold. Bema Gold, Agnico-Eagle and Kinross are good stocks to be buying as well as others. Other gold stocks are mentioned in our gold mining category. If anyone has any other suggestions of gold stocks, or comments on this article, please leave them below. This company is a miner of both gold and silver and I guess it is thought of by the investing community as more of a silver producer. However, having produced 140 000 plus ounces of gold in 2005 we think it qualifies for a spot in our portfolio. Hecla Mining is a low cost primary silver producer in North America, producing 6 million ounces of silver at an average total cash cost of $2.96 per ounce in 2005. Hecla also produced gold at an average total cash cost of $337 per ounce. So from this we can glean that as a company they are solvent and are generating good cash flow. This is very important as it provides a solid financial basis on which exploration activity can be founded. And it is the possibility of a new major strike that is attractive to us as investors. This precious metals mining company has exploration properties and operating mines in superb mining areas worldwide. Hecla’s excellent exploration prospects, management ability, minimal debt and good cash position make this an excellent precious metals prospect as an investment. In putting our money on the table we are mind full of an exit strategy in all cases. With this particular mining stock we are thinking long term and intend to buy and hold. We may have to eat our words though if it rockets and presents us with an opportunity to take some profits off the table. We will inform if that opportunity appears to be developing and also if and when we sell. From a geopolitical standpoint Hecla is active in the United States, Mexico, Venezuela and Alaska. We are quit comfortable being in these areas although mining gold at the La Camorra Unit in Venezuela will need to be watched. The La Camorra Unit in Venezuela produced just over 100,000 ounces of gold in 2005. Hecla’s common stock has been traded on the New York Stock Exchange for approximately 40 years under the symbol “HL.” This company increased their gold production by 51% in the first quarter of 2006 and recorded earnings in excess of $38 million. From the chart we can see the stock has recovered from the market sell off and is sitting just on its 200 day moving average. To us this is a good place to shop in the life cycle of a stock. At the time of writing this mining stock has a Market Capitalisation of $628 and a P/E ratio of 35 and closed at $5.27. It may indeed move down from here and provide you with a better buying opportunity later in the summer. However, we think that the downside for this gold and silver mining stock is limited compared to the upside potential, which we believe to be explosive in the very near future along with the rise in gold prices. This is a diversion from the norm for us as this company generates its cash from Copper and Molybdenum mining. However there is a gold kicker to it, which adds some extra spice. Taseko Mines Limited is traded on the TSX as TKO and on the AMEX as TGB. Taseko is part of the Hunter Dickinson group who has an enviable track record. The function of Hunter Dickinson is to provide a complete service that encompasses geology, finance, investment and guidance on government and regulatory affairs. We will probably cover Hunter Dickinson more fully in a future article. Second quarter results for Taseko showed that they had generated an operating profit in the order of $7.4 million, mainly from their Gibraltar facility in British Columbia. The company intends to spend $62 million on an expansion programme at this mine in order to increase production from 70 million to 100 million pounds of copper per year. This tells us two things; firstly that they are solvent and have good cash flow and secondly that they have the funds to expand. The best mining story in the world cannot be a success without the funding to exploit the situation. Taseko also owns a 100% interest in the Prosperity mine, which is also located in British Columbia, Canada. A lot of work has already been carried out in terms of exploration, planning, engineering, etc., with the indications that this is a large Copper and Gold deposit. By early 2007 an Environmental Impact Study, which is well on the way, will be more or less complete setting the stage for production. Looking longer term they also have the Harmony project which is located on Graham Island, British Columbia, Canada. This has a large gold deposit with further investigation needed to establish the full extent of the total resources. Geopolitically we consider Canada to be one of the safest places to conduct mining exploration. Taseko has a market capitalisation of $288 million and a P/E ratio of 8.18. Its stock price has recently dropped in line with the market sell-off from approximately $3.90 to $2.10 per share and closed yesterday at $2.78. We are buyers at this price and expect this recovery to continue and to beat its previous highs in the next twelve months or so.